blueLABEL is a separate marketing identity from Germany’s Riese & Muller premium bike manufacturer. Unlike the main R&M range which all have full suspension, blueLABEL bikes are only fitted with front suspension. 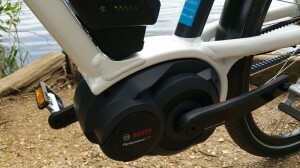 They are distributed in the UK by AMPS.bike, based in Kent. We recently reviewed the blueLABEL Pony from Riese and Muller (you can read our review here) and found it to be a very capable bike, nippy, comfortable and easy to manoeuvre with nothing really to fault. 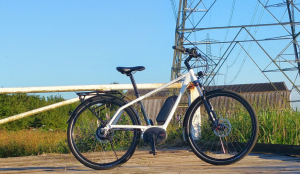 The Pony is a very good urban/city bike as well as being just as much at home for recreational rides, whereas the Charger is honed for long distance comfort for those wanting an electric bike for commutes, light trails and touring. White seems to be the fashionable colour of choice in car paint finishes in recent times, so the Charger fits right in with its stark white frame standing out against the black contrasting seat tube and rear carrier. It’s a very clean look without any lairy graphics or decals. As with the Pony, it oozes quality, though again comes with a hefty price tag of between £2,529 and £3,349. As with the Pony there are several versions of the Charger available, opening up options for those preferring belt, chain or hub drive. There’s also several styles and colour options including a cruiser, mountain bike and even a GT-45 Speed-Pedelec version. For more details on the blueLABEL Charger Nuvinci specification click here. If you are buying your bike from a dealer then everything should be set up ready for you. Our fresh out-of-the-box bike needed the usual few extra things to be done, such as aligning the bars and fitting the pedals. As with the Pony, as soon as I stepped onto the Charger I felt straight the quality of the bike straight away. 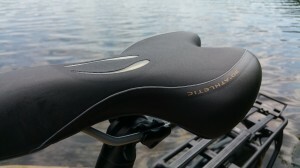 Everything feels smooth and solid with a good, stable riding position. The paint finish is excellent – no blemishes or overruns anywhere and all the cables are neatly tucked away in a recess underneath the top tube and inside the frame elsewhere. The elevated rear stays add to the sporty look. Turning the bike on is as easy as pressing the power button on the Intuvia display. I set the power setting to “Turbo” and headed off. There isn’t really anything new to say about the Bosch Performance Line motor on this bike, but pulling away was smooth and swift, as expected. There is a distinctive hum as you set off, which eases off as you hit your cruising speed but it’s never intrusive. The 15.5mph limit is reached swiftly, with an indicated 16.2mph on the Intuvia LCD display (so, as with the Pony, within the tolerance of the law) and you can control the amount of assistance you receive using the remote buttons. 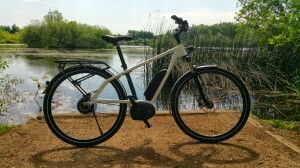 This Charger e-bike is also fitted with the Nuvinci N360 hub gear system and a Gates carbon belt drive instead of a chain. I really enjoyed this combination on the blueLABEL Pony and it is the same again here. Changing ‘gear’ is done by twisting the Nuvinci grip on the handlebars and gives you an almost unlimited number of ‘gears’. The carbon belt drive is very smooth and quiet, doesn’t require oiling and therefore is a good option if you want to travel to the office in your work clothes. 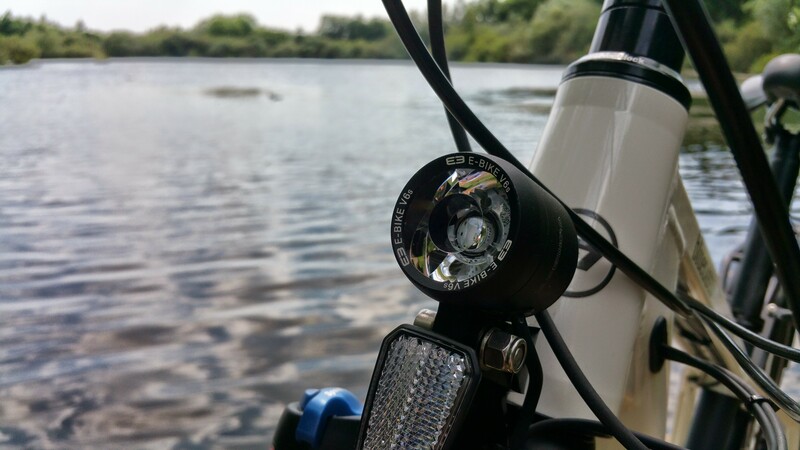 For the darker nights, the excellent Supernova front E3 E-Bike V6s LED light chucks out a decent beam of light – especially useful if you commute on unlit country roads littered with potholes. 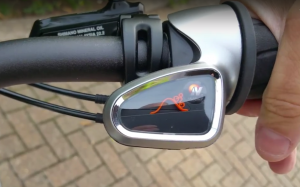 There is also a rear LED light and both front and rear lights are powered by the Bosch battery, so you don’t have to bother fitting them with separate batteries. Testing in almost flat conditions and lighter winds, I eaked 36 miles out of a fully charged battery. This was based on trying to keep the bike around the 15.5mph limit as much as possible. As with all these figures, you need to make allowances for weight, riding style, conditions and so on. Using “Eco” mode I managed to get just shy of 68 miles before the usual flashing battery level on the Intuvia display. 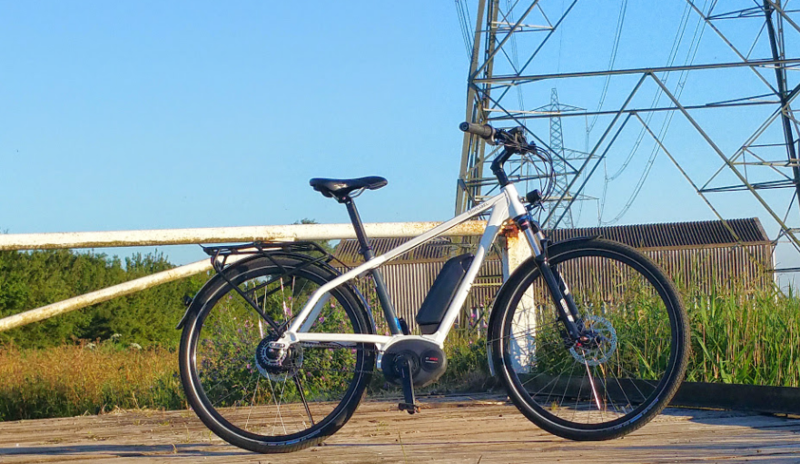 As East Anglia is sorely lacking some decent hills, I took the opportunity when returning the bike to test the Charger in the area around the headquarters of AMPS. Located in the rolling hills of the Kent countryside, I headed off onto Pilgrim’s Way, a road heavily used by club cyclists for training. With a few of the local roads and bridleways offering a difference in elevation of almost two hundred meters over a short distance, it was a good opportunity to put the Bosch Performance motor to work. This is also where the Nuvinci hub gear shines as you can make small adjustments to suit the conditions; this, paired with the Performance motor made light work of the hills. I’d seen some heavy rain forecast for the morning coming across from the south west and I got to Kent just in time to do the bulk of the hill climb test. At the end, it did bucket it down. Thankfully, the hydraulic brakes are very good, with plenty of stopping power and feedback as the roads were fast becoming a stream! 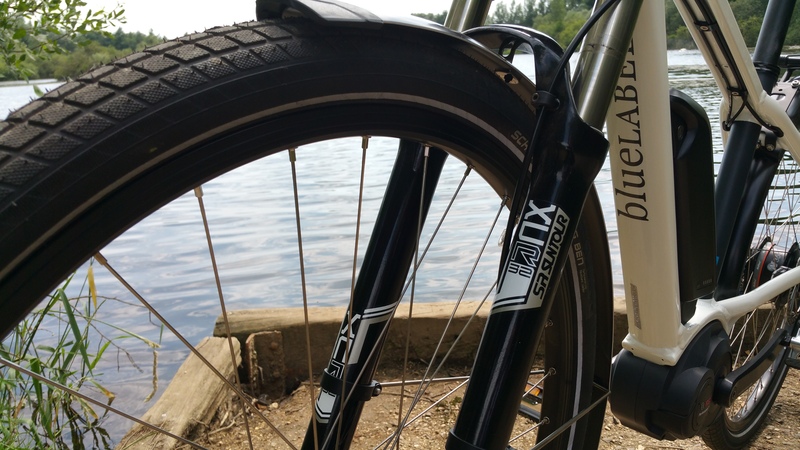 The Charger is ideally suited for commutes and gentle trails with its large 29″ wheels and Schwalbe Big Ben tyres. It also comes fitted with mudguards for the typical British weather and LED lights for the evenings and winter months. One advantage of the Nuvinci drive is in urban and city environments, where you need to constantly stop and start in traffic. It’s quick to change to the most suitable gearing, so if you have to stop suddenly, you don’t have to worry about being in the wrong gear as you simply twist the gear shifter round to start in the lowest gear for starting off again. 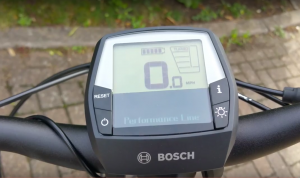 The Performance Line motor gives up to 275% assistance and 60Nm compared to 250% and 48Nm of the Bosch Active Live and this helps to provide a zippy ride to get you to work quickly. The Charger is fitted with coil-sprung Suntour XCR 32 forks which have a lockout and up to 100m of travel and are fine for urban riding and trails. They are at the budget end for forks but then this isn’t a bike you will be doing serious off-road stuff on and they were fine during my test riding. Saddles are very much a personal preference, but I found the Freccia Lookin saddle to be very comfortable, especially on the longer rides. Usually there comes a point where you need to lift off the saddle for a moment or two, but I didn’t need to with this one. It also helps that the Charger has a good riding position. In terms of weight, the Charger comes in at around 23.8kg, so it’s not a bike you’ll be hauling up and down the stairs too often. The Charger is very robust. It adeptly tackled steep hills (and stopped at the bottom!) in a downpour and I liked the riding position. The quality of components is evident, the paint finish is flawless and although overall styling edges towards utilarian, in some ways it is a no-nonsense, no-fuss, practical bike. I am particularly thinking of the ease of the Nuvinci gearing here – so the ‘clean look’ suits its purposeful disposition. The price point is at the higher end of the spectrum, but for those looking to invest for a comfortable, confident ride and with a blueLABEL-sized budget, I can see it ticking the right boxes. 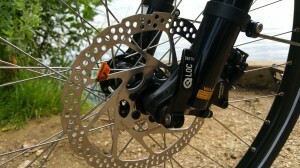 There is a 5 year warranty on the frame and the motor/battery other components are warranted for 2 years. Available through AMPS.bike dealers and via their website.